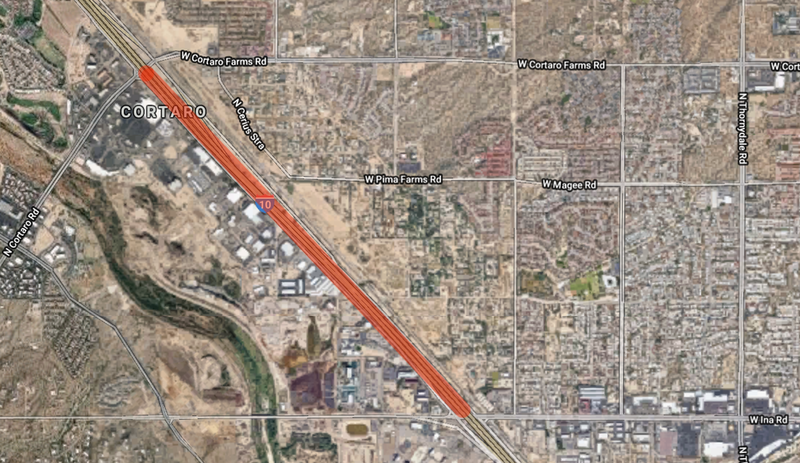 Motorists who use Interstate 10 near Ina Road should expect lane closures for barrier work the nights of Monday, Feb. 11, and Tuesday, Feb. 12. I-10 will be reduced to a single lane in each direction between Sunset and Cortaro roads from 8 p.m. to 5 a.m. the following morning. Schedules are subject to change based on weather and other unforeseen factors. For more information, please call the ADOT Project Information Line at 855.712.8530 or email Projects@azdot.gov. For real-time highway conditions statewide, visit ADOT's Traveler Information Site at www.az511.gov, follow ADOT on Twitter (@ArizonaDOT) or call 511, except when driving.